TAOS – A native New Mexican once found in streams and rivers throughout the state has returned home after a 60-year absence. Five river otters were released today in the waters of the Rio Pueblo De Taos on Taos Pueblo. The wild otters were trapped and transported from Washington by USDA Wildlife Services and Taos Pueblo as part of a larger otter reintroduction program organized by Taos Pueblo, The New Mexico Department of Game and Fish, the U.S. Bureau of Land Management, and the New Mexico Friends of River Otters, a coalition of citizens, agencies and conservation organizations dedicated to restoring otters to the state. "Protecting and restoring native wildlife is important to the heritage and ecology of New Mexico, and one of the main roles of the Department of Game and Fish," Department Director Bruce Thompson said. "Today’s release is a positive first step in an effort to return otters to watersheds across the state." River otters are highly social, playful, semi-aquatic members of the weasel family. They are believed to have once inhabited the Gila, upper and middle Rio Grande, Mora, San Juan and Canadian river systems and occasionally were mentioned in the journals of early settlers. There have been no confirmed sightings of river otters in the state since 1953. Decades of trapping and habitat loss are believed to be two factors in their disappearance. 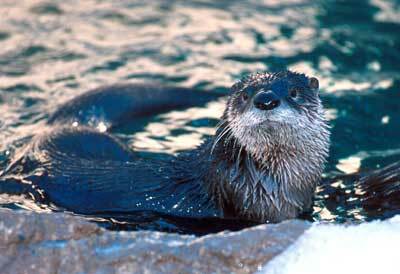 Current regulations require trappers to release any otters caught in traps. "We are so thrilled to see this species back in New Mexico," said Linda Rundell, state director for the Bureau of Land Management. "We’re working with partners throughout the state to restore watersheds and wildlife habitat; the icing on the cake comes when we can restore species like the river otter to their rightful place in New Mexico." Twenty states, including Arizona, Colorado and Utah have successfully reintroduced river otters. River otters and other predators play important roles in keeping communities of native species robust and diverse. "We are extremely excited that Taos Pueblo has taken the initiative to ensure that our playful furbearing friends are once again diving and swimming in the Upper Rio Grande Watershed," said Melissa Savage with the New Mexico Friends of River Otters. In 2006, the State Game Commission directed the Department of Game and Fish to initiate efforts to restore otters to state waters. A Department study identified several rivers as suitable restoration sites, including the Upper Rio Grande, White Rock Canyon and Middle Rio Chama in the Rio Grande Basin; and the Upper Gila, Lower Gila and Lower San Francisco rivers in the Gila River Basin. A second, larger release is scheduled on the main stem of the Upper Rio Grande in November. The New Mexico Friends of River Otters, a coalition of government agencies and conservation organizations, plans to release additional otters. Members include Amigos Bravos, Earth Friends Wild Species Fund, Center for Biological Diversity, Defenders of Wildlife, Four Corners Institute, New Mexico Wildlife Federation, Rio Grande Chapter of the Sierra Club, Upper Gila Watershed Alliance and the U.S. Bureau of Land Management.